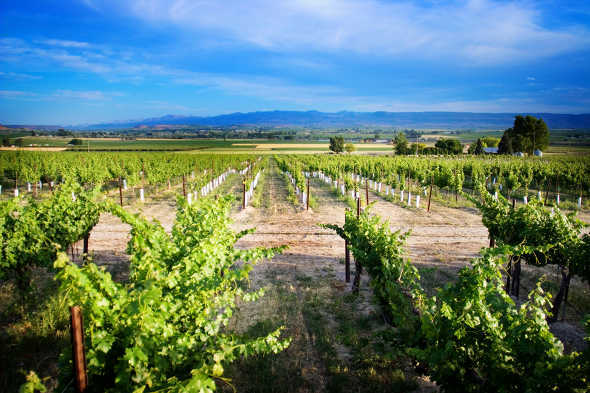 You may have never sampled Idaho wine or been aware that a large American Viticultural Area was designated in 2007 which covers over five million acres across Southern Idaho. You might not even know that Idaho has been in the wine business for almost 150 years, but now you no longer have an excuse. The spread of the Northwestern wine world from the Willamette to the Columbia Gorge to Walla Walla has found its way to the Snake River Valley. And if you thought it was still the case, Idaho isn’t just for potatoes anymore. With 48 wineries, 34 located in the AVA, Idaho is finally generating buzz from vine to glass. A few of the people contributing significantly to that buzz work at the Urban Winemakers Cooperative in Garden City, the home of Cinder, Vale and Syringa wineries. Melanie Krause and her husband Joe, of Cinder, came together with John Danielson of Vale Wine Company in 2007 to start the cooperative. Melanie grew up in Boise but moved to Washington to develop her winemaking career. After spending five years at Chateau Ste. Michelle she returned to Boise. John grew up among the farmers and ranchers of the Snake River Valley working at the John Deere dealership owned by his father’s side of the family and the ranch owned by his mother’s side. 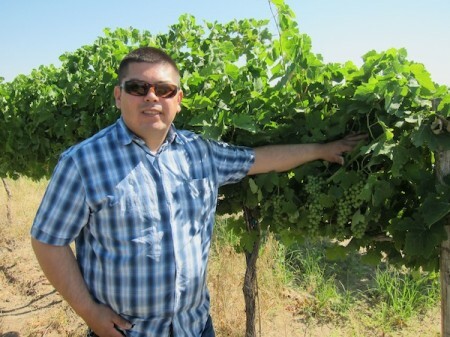 After interviewing and volunteering for many vintners in Idaho, Washington and California, he decided to get a certificate in Oenology and Viticulture from UC Davis and go into the business for himself. On a warm, Friday afternoon in October both Melanie and John were busy at the cooperative coaxing the finest possible product from freshly harvested grapes. But they were still willing to spend a few minutes during this frantic time of harvest to show me around the place and tell me about life making wine in Idaho. The summer of 2009 has seen an over abundance of grapes in Idaho which has left some thinking that planting should wait for wineries to catch up. Melanie, on the other hand, continues to champion more plantings, but advocates for a broader selection of varietals and more producers from which to choose. She admits that working in Washington, with the extensive selection of grapes and growers available there, may have spoiled her just a little. She explains the glut of Chardonnay, Syrah and Cabernet in the Snake River Valley as the result of having a single winery, Ste. Chapelle, responsible for such a large portion of the wine production. In order to stabilize the growth of the new AVA she says that the Snake River “needs to mature,” and explains that a transition away from hobby wineries to a more professional industry would result in larger and smarter winery production for Idaho. Whichever way you slice it, Idaho’s wine industry has great potential. Slightly more than 1,100 of the Snake River AVA’s over 5 million acres have been planted in vineyard. Property prices are relatively low. Climate is ideal. The local consumer base has surprised producers with its appetite for local wines, and even folk from as far as Salt Lake City are making the trip by the busload to experience Idaho’s wine country. On top of that, locals such as Ron Bitner, a Caldwell rural economic development specialist who owns Bitner Vineyards, and Steve Fultz, director of the Caldwell Canyon Economic Development Council, are helping to develop a teaching vineyard and a cooperative tasting room in the area. Treasure Valley Community college has started a Viticulture program and is planning an Oenology program as well. All of this bodes well in helping Idaho beat its reputation for producing nothing but beets. When asked what she thought people needed to know about Idaho and wine, Melanie Krause laughed and said that, “Idaho isn’t the Great White North. It’s actually quite temperate.” At the time she said this we were sitting outside enjoying the seventy-degree weather, in October. Fortunately, one thing that has persisted in Idaho’s wine industry, despite its booming although immature growth, has been its small town feel. The Saturday morning farmers’ market in downtown Boise, otherwise know as BoDo, is a great place to experience big city culture with small town charm. Wineries offering free tastings are peppered throughout the market. At many of the booths enthusiastic grape growers and winemakers can be easily hit up for conversation about their product even during the busy month of October. Back at the cooperative, John Danielson of Vale Wine Company let me look on as he began the press of his first harvest of Syrah, and gave me a preview of his first homegrown Riesling. The Riesling will be available next year while the Syrah will have to wait until 2011. Further out in the country, between Marsing and Caldwell, Ron Bitner himself, of Bitner Vineyards, gave us a tasting and talked us up a bit about the goings on in the valley. Back in Boise, Pat, the owner of Bueno Cheapo Vino, made a balloon animal for my buddy’s little kid while we tasted wine and perused the store. Out of the over 1,500,000 people that live in Idaho, almost half live in the AVA. That means there is one person per every 7 acres throughout the Snake River AVA, making the area a great place to live or to visit. This mostly rural area is the heart of the Idaho wine world, which is producing better and better wines every year. And while Ste. Chapelle is by far the largest winery in the state, many others are not to be missed. As for me and my trip through Idaho’s wine country, it ended with me at Bitner Vineyards, sitting on the deck at their tasting room, sipping a glass of 2005 Merlot Petit Verdot and watching the sunset over the Snake River. David Mark Brown is a freelance writer and author as well as a home winemaker and proud owner of his urban vineyard (of 12 vines). You can follow David’s current projects at David Brown Writes. David and his family currently live in Salt Lake City and have lived in the Rocky Mountains for the last seventeen years. 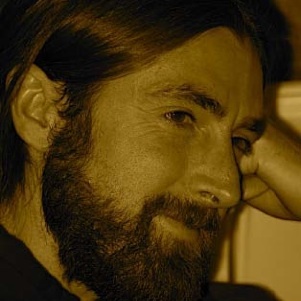 Other than wine, David is interested in sustainability, justice, inspiration, rural living, simplicity, green construction, hospitality and just about anything exploring the depths of the human condition (especially after having a glass of Spanish Tempranillo). I’ve just ordered 6 bottles of 2008 Syrah from Coiled, http://www.coiledwines.com from the Snake River AVA. Very excited to try the wine. It’s crazy to me to see my high school friend, Melanie Krause, become such a successful winemaker. Her wines are amazing and are growing in mass popularity within not only the local arena, but other areas as well. I love the connection with winemakers around Idaho. Although we do have delicious russets, it’s fantastic to see this great state get more descriptions than “potatoes”. Great article! Idaho is an interesting story, really amazing how much wine comes from there. However, after tasting MANY wines from Idaho I have to say that overall there is a long way for the industry to go before they can be considered a quality wine region. I noticed in among your tags that you have it as “Joe Krause.” Actually, it’s Joe Schnerr. His wife, Melanie, is correct in her comment about Ste. Chapelle’s control of the grapes and grape prices in Idaho. The Snake River Valley will continue to develop as a wine region, but it will need Ste. Chapelle to step up as a leader and champion for the state, just as Ste. Michelle Wine Estates continues to do for Washington. During the final months of active publication and third party validation work under Best of Appellation, we had the opportunity to review Idaho wines submitted under a BOA call for wines. One well respected independant consulting winemaker based in Napa commented that the Snake River Valley Syrah submitted was at the top of his list for Syrah. Maybe having Syrah is not such a bad thing. For sure the Snake River Valley AVA has a lot of desireable qualities to expand upon. Thanks for the great comments. You are right Rob when you say that Idaho has a ways to go. The faithful there have made a wonderful start, but there is still much work to do. And thanks Cyndee for your own connection, and for the photo! This makes me want to take a tour of the Idaho wine country. It seems like an ideal place to grow grapes with less disease problem from humidity. It is always a mistake to depend heavily on one variety, though, since that leaves you more vulnerable to disease. Wow enjoyed reading this article. I added your rss to my blogreader. Its now 2010 and we are taking folks around to the various tasting rooms. The doors to Idaho’s Wine Country are wide open!